Boso Peninsula (房総半島, bosohanto) is the south east side of Kanto area. The coastline faces Tokyo Bay called Uchi-bo(内房), and the coastline faces Pacific Ocean called Soto-bo (外房). 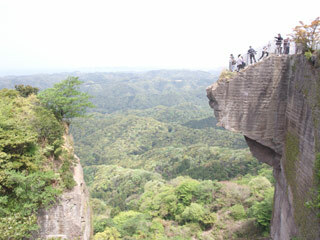 Most of the cities are located along the coastline and middle part of Boso Peninsula is mostly mountain. Because access to Uchi-bo is very good from Tokyo, many people visit here for delicious local fish and hiking. Soto-Bo has the Kujukurihama (九十九里浜) Beach which is one of the longest beach in Japan. So in summer many people visit there for summer vacation. Use Shuto Express Way to Aqua Line. Exit at Kisarazu. Use JR Sobu Line to Chiba Station. Change to JR Uchibo Line to Kisarazu Station.